by Chris Woodford. Last updated: September 30, 2018. It's hard to believe, but everything in the world is in motion, all the time. Even things that look perfectly still are packed with atoms that are vibrating with energy. Understanding how motion works was one of the great milestones of science and it's credited to the brilliant English physicist Sir Isaac Newton. His laws of motion, written over 300 years ago, were so well stated that scientists still use them in most situations today. The basic idea Newton taught us is that motion is caused by forces—which is easy enough to understand: kick a ball (the force) and it flies into the air (the motion). But forces don't always make things move: a bridge has lots of forces acting on it, but it doesn't go anywhere. Also, the "motion" forces produce is sometimes a shift in the direction in which something is moving or a change in its shape. So what exactly are forces and how they do they produce these different kinds of motion? It's time to take a closer look at the science of moving things! 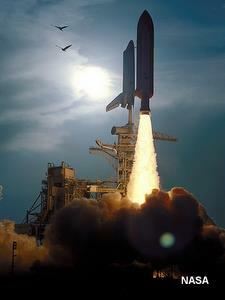 Photo: A space rocket is an impressive demonstration of Newton's laws of motion. The force of the hot exhaust gas shooting backward propels the rocket forward. The rocket isn't moving by pushing against the ground; it can move forward like this even in "empty space," confirming the essential truth of Newton's laws. Photo by courtesy of NASA on the Commons. "May the force be with you" is a strange thing to say to someone, because there's a never a moment when forces aren't. Forces are the hidden power behind everything that happens in our world—and beyond. Forces make your heart race and your lungs pump; they swing the planets round the Sun and bind atoms tight. Think of anything, absolutely anything, that's going on in the universe right now, and you can guarantee that somewhere, somehow forces are responsible. Photo: Forces are the power behind our world. Thump an object with a big enough force and it will accelerate to a very high speed. 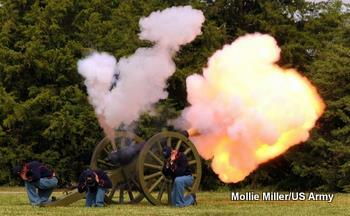 That's the basic idea behind bullets and missiles like the one blasting from this replica of an 1855 cannon. Photo by Mollie Miller published under a Creative Commons Licence courtesy of US Army/Flickr. Kick a ball and it'll fly up into the air before falling back down to the ground. That's an example of everyday forces. What exactly is a force? A force is a pushing or pulling action that can make things move, change direction, or change shape. Kicking a ball involves you applying a force (a push with your foot) that makes it fly upward. But once it's shooting through the air, the invisible force of gravity pulls it back down to Earth—and that's a different force taking over. 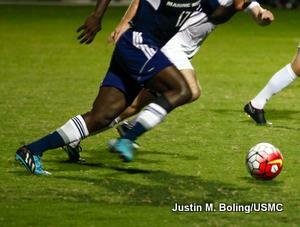 Photo: In soccer, several different forces power the ball from your foot to the goal. Photo by Justin M. Boling courtesy of US Marine Corps. Look a bit more closely and you'll see some other forces working on the ball too. When your foot meets the blown-up ball, the ball squashes inward a little bit because it's made of plastic or leather. So there's a force there too, causing the ball to change shape. Because the ball is stretchy (elastic), it rapidly expands again, returning to its original shape—and it flies into the air by pushing out against your foot. That's also a force. When the ball finally hits the ground, it squashes in again before flexing back out, and that makes it bounce into the air, maybe several times. More forces! As the ball rolls across the ground, it scrapes against the grass or concrete and gradually comes to a halt. Another force is at work there—the force of friction—stealing the ball's energy and bringing it to rest. So everything that happens to the ball, in its entire journey from your foot to the ground, involves a series of forces pushing it, pulling it, stretching it, or dragging on it. When we're looking at how things work or move, we try to identify the force that's responsible. So when a flying ball zooms to the ground, we say "Aha! That's the force of gravity." But it's very rare to find only one force acting on something. Most of the time, there are several different forces working at once, all pulling or pushing with different strength, often in completely different directions. The effects of all these forces add together or subtract from one another to produce an overall force (or perhaps no force at all). Sometimes all the forces are exactly in balance—their effects cancel one another out. If you look at a giant suspension bridge, it's not going anywhere or changing its shape, so you might think there are no forces acting on it. Wrong! 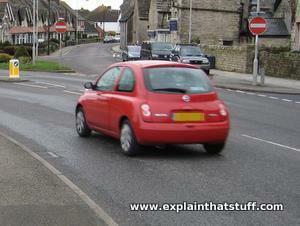 There's the weight of all the cars driving across it pulling downward, plus its own weight. So why doesn't the bridge tumble into the river? The force of gravity pulling down on the bridge is exactly balanced by tension (pulling forces) in the suspension cables tugging it back up again. Because all the forces on a bridge are equal, the bridge itself goes nowhere—so it's safe for the cars to drive across. Artwork: Bridges are giant static structures, but that doesn't mean they're force free. 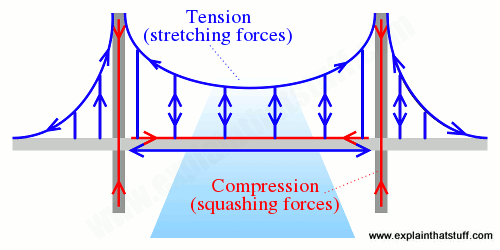 Bridges carry loads by balancing them with stretching forces (tension, shown in blue), squashing forces (compression, shown in red), or both. Different types of bridges do this in different ways. In a suspension bridge, the towers are in compression (squashed down) while the huge cables that support them are in tension (pulling tight). But there are also times when different forces act on something without canceling out. Suppose you're in a sailboat, making very little progress in a strong wind, so you decide to use your outboard motor. Waves might be pushing your boat in one direction (that's one force), the wind could be pushing a different way (another force), and, depending on how you steer, your engine will be pushing another way (a third force). There's also a force between the bottom of the boat (the keel) and the water. All these forces act in different directions, a bit like a multi-directional tug-of-war. If your boat moves in a certain direction, one of the forces must be winning. We call that the resultant force—because it's the overall force that results when several forces act on one object at the same time. It's just as though the resultant force is the only force that's acting on the object and all the other forces have disappeared. When a force acts on an object, it often makes it move faster or in a different direction. Once something is moving, you don't need a force to keep it moving: it will carry on moving all by itself unless another force stops it. When a rocket blasts into space, you need a force to make it lift off to begin with and to overcome the force of Earth's gravity. But once the rocket is in space, it will carry on moving all by itself until and unless another force stops it. Any time you want to make something speed up (accelerate) or slow down (decelerate), you need to use a force. In fact, you always need to use a force if you want to alter how something is moving. English scientist Isaac Newton was the first person to figure out properly how forces change the way things move. He worked out three simple principles, called Newton's laws, that explain how this happens. We'll come onto all that in a moment. It takes a force to make something move in a different way, and that includes changing the direction in which something is moving even if its speed stays the same. If you want to make something go round in a circle, you have to apply a force to make it turn and keep on applying that force to keep it turning. That makes sense: something moving in a circle is constantly changing direction, so you have to apply a force all the time. In the sport called throwing the hammer, an athlete swings a heavy weight around their head using a long steel wire. As long as they keep pulling the wire, they're applying a force, which is called centripetal force, and this force keeps tugging the weight round and round in a circle. As soon as the athlete lets go of the hammer, there's nothing to provide the centripetal force anymore, so there's nothing to keep the hammer turning in a circle. At that point, it flies off in a straight line before curving through the air as gravity brings it back down to the ground. Photo: Hurricanes are powered by force. The air pressure is higher at the edge than in the middle, creating a force toward the center—centripetal force—that makes the air rotate at high speed. 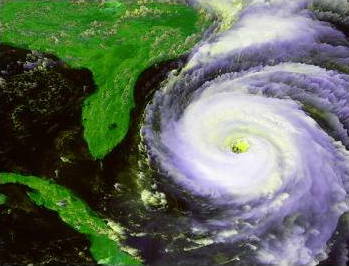 This photo shows Hurricane Fran heading for North Carolina and Virginia in August 1989; it went on to cause about $5 billion worth of damage. Photo courtesy of NASA on the Commons. Look carefully at things whirling in circles and you'll always find a centripetal force, somewhere, that's doing the turning. As your laundry tumbles round in a clothes washer, it'll collect a huge amount of water, which has to be removed during the final spin. The washer drum whirls at high speed, constantly pushing the clothes round in a circle and providing centripetal force to keep them turning. The water inside the clothes pushes through their fibers. There's nothing to hold it in place—no centripetal force—so it flies out through holes in the outside of the spinning drum, helping to dry your clothes. Hurricanes are another example of how forces make things turn in a circle. There's very low pressure at the center of a hurricane and higher pressure toward the edge. That means there's an overall pressure pushing toward the center and this provides the centripetal force that makes the air spin around, giving the powerful whirling motion that makes hurricanes so very destructive. Artwork: Spin-drying laundry uses the power of centripetal force. 1) A clothes washing machine has a rotating drum (white) with holes in it mounted inside a static drum (red) that's completely sealed. 2) As the inner drum spins, it pushes your clothes round in a circle, supplying the centripetal force that makes them turn. 3) The water inside the clothes can move freely and there's no centripetal force to make it move in a circle, so it flies off in straight lines through holes in the drum. 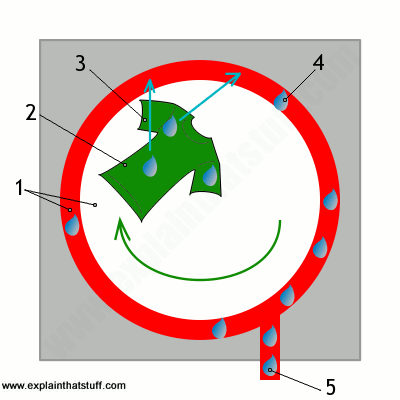 4) The water collects in the outer drum. 5) At the end of the spin cycle, the water pumps out through a drain pipe. Forces make things move—but they also bring moving things to a halt. Roll a toy car over a rug and it'll quickly come to a standstill. The force of friction steals the car's energy and slows it down. Friction is the force between two different objects that are in contact, either when they're locked together and touching or when one of them slides past the other. Perhaps surprisingly, friction can help things to move and stop them from moving at exactly the same time. Take a wheel, for example. When a car goes round a corner, friction holds its tires in place, giving powerful grip that locks the car to the road and stops it skidding outward. As the tires grip the road, the wheels push forward, moving the car along. At exactly the same time, however, friction between the wheels and the axles that hold them steals some of their energy, slowing them down. So friction can be both a good thing and a bad thing. When you park on a hill, friction is the reason your car is still there when you get back next day. But it's also one of the reasons you have to put so much gasoline in your tank: friction between your car and the air you drive through steals quite a lot of the energy that would otherwise be speeding you down the road. In machines and engines, friction is usually quite unhelpful. The constant rubbing of one part against another wears out even very hard and durable metals like stainless steel. That's why engineers use lubrication: by squirting liquids and gels between moving parts, we can help them slide past one another with less friction, reducing wear-and-tear, cutting maintenance costs, and reducing energy losses. Have you ever tried tugging the aluminum ring-pull of a drinks can and found it suddenly snaps off in your hand? What you're trying to do is use a force to make the ring-pull move and change direction at the same time. But instead of doing what you expect, one part of the ring-pull snaps away from the other. 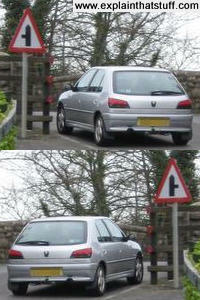 This is an example of how forces can change an object's shape, instead of making it move or change direction. Every time you change something's shape (and that includes breaking or snapping it), you're putting forces to work. 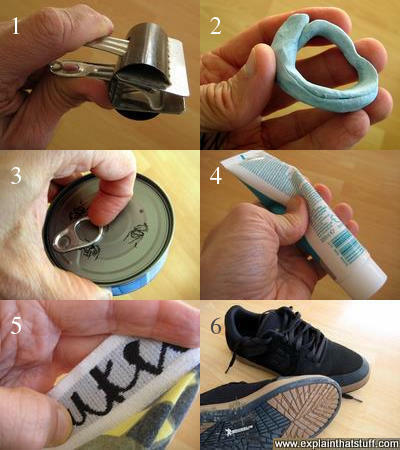 Whether you're crushing a can for recycling, tearing a piece of paper to shreds, or stretching the elastic on a catapult, you're making something into a new shape. That involves rearranging the atoms inside it, and, because atoms are generally locked tight in solids, it takes force. Exactly what effect a force has depends on the materials involved. Soft materials, such as rubber, bend and flex very easily and spring back to their original shape when you take the force away again. Materials like this are called elastic. A lot of materials change shape easily but don't spring back the way they were; these are called plastic (though they're not always made of plastics—even soft metals, like gold, can be plastic if they readily change their shape). Some materials don't seem to change shape when you apply forces, though they do change very gradually over a period of time. If you straighten a paperclip, you're using a force to make it plastic—to cause what's called a plastic deformation (a change of shape that isn't reversible). If you do this several times, the paperclip will snap in half—a different kind of reversible change. That's an example of what's called metal fatigue, which is where repeated forces cause a material to break completely. It's one of the reasons that parts fail in machines like aircraft and automobiles after flexing back and forth hundreds, thousands, or sometimes even millions of times. Photo: Forces change different materials in different ways. Elastic materials change shape when you apply a force but go back to their original shape when you take the force away. Plastic materials also change shape, but stay in their new shape when you remove the force. Everyday objects use elasticity and plasticity in many different ways: 1) Elastic: This large paper clip uses the elasticity of metal to spring back to shape; 2) Plastic: putty takes whatever shape you push it into; 3) Elastic and plastic: The ring-pull in this can is a little bit elastic, but if you push it too far, it cuts into the can beneath causing a permanent, plastic change of shape (the can rips open); 4) Plastic and plastic: Toothpaste moves wherever you push it, so it's plastic like the tube that contains it; 5) Elastic and plastic: The elastic waistband of your clothes keeps them in body-hugging shape, but it will eventually sag through slow, plastic change; 6) Elastic and plastic: The uppers (top parts) and soles of sneakers are elastic so they spring back to shape, but they also permanently change shape as you wear them, molding to the shape of your feet so they fit you more comfortably. You can make quite a lot of force with your body. Weightlifters can raise huge lumps of metal above their heads, while some professional strongmen can pull trucks, trains, and planes even with their teeth. But there's a limit to what even the toughest athlete can do. Thanks to human ingenuity, that's not the end of the story. With clever things called simple machines, we can make our arms and legs move much bigger and heavier weights. Simple machines include levers (such as wrenches), pulleys, ramps, wheels, and gears. All of them work by allowing your body to produce more force than it can make alone. So if you use a wrench to turn a rusty nut, you're using the power of a lever to magnify a force: the longer the lever, the more the force at the center is magnified. You apply less force at the edge (so it feels easier), but the wrench magnifies the effort you apply, converting it into more force at the center (so the nut turns more easily). The catch is that you have to turn your end of the wrench a bigger distance to make the tough rusty nut budge. Giant everyday machines like cranes, diggers, bulldozers, and combine harvesters use a whole series of simple machines to carry out complex jobs. Most of them have hydraulic rams, which are liquid-filled cylinders a bit like water pistols, that are thicker at one end than the other. As the liquid moves from a smaller volume to a bigger one (from the thin end to the thick one), it slows down but gains force. And that's how a hydraulic ram, operated by a person's arm, can do something like lifting a truck clear of the ground. Photo: A digger like this magnifies forces using hydraulics: it squirts a liquid through hydraulic cables and pipes (blue) to operate the hydraulic rams (red) that push and pull the arm and bucket. Forces keep us firmly in our place. You're sitting still reading this right now because atoms in your chair, electrically repelling atoms in your body, are creating an upward, pushing force that exactly balances the force of gravity, pulling down. Gravity is the biggest, boldest force most of us ever encounter and it stretches all the way from Earth's fiery center to the other side of the universe. Great human achievements have often meant mastering—and overcoming—forces like gravity. When the Wright brothers made the first powered flight in 1903, they used wings and an engine to generate an upward force called lift that was strong enough to overcome gravity. Astronauts blasted up into space after pioneers like Robert Hutchings Goddard figured out how to use space rockets to make enough force to "escape," temporarily, from the pull of Earth's gravity. When Jacques Piccard and Don Welch dived almost 11km (6.7 miles) to the bottom of the deepest ocean in 1960, they did it in a super-reinforced diving bell (a bathyscaphe named Trieste). It had walls 12.7cm (5.0in) thick to resist the enormous, crushing force of water pressure at that depth—something else caused by Earth's gravity. Anyone who tries to go further or faster for longer has to master forces of one kind or another. Engineers who've developed cars that can beat speed records have learned to battle forces like friction and drag (air resistance). Stars of track and field who run further or jump higher have trained their bodies to produce more force for longer so they can conquer their opponents. Armies with faster planes, tougher tanks, or guns that fire bullets further are all using forces to their advantage. Some of us use our brains to think smarter. Others think more creatively and do surprising and original things. But every physical achievement ultimately boils down to using science to overcome forces like gravity and friction, so we can do "impossible" things no-one has ever done before. Understand the science behind the scenes and the force will always be with you! We've already seen that forces can make things move, but how exactly are forces and motion linked together? How can we measure different amounts of motion or figure out where a flying bullet or a soaring space rocket is going to end up? Isaac Newton's work helps us tie forces and motion together in an easy-to-understand way. It also lets us calculate how things will move when we apply forces to them. 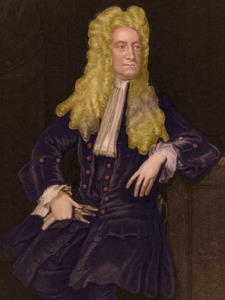 Photo: Isaac Newton—the man who put science in motion. Picture from an 18th-century engraving by William Thomas Fry courtesy of US Library of Congress. When a force acts (pushes or pulls) on an object, it changes the object's speed or direction (in other words, makes it accelerate). The bigger the force, the more the object accelerates. When a force acts on an object, there's an equal force (called a reaction) acting in the opposite direction. This law is sometimes written "action and reaction are equal and opposite." How do those laws run in practice? Suppose you're standing on a skateboard. Unless you kick against something, you'll stand on it forever going nowhere. That's Newton's first law in action. Now if you kick against the sidewalk, you start moving: your speed increases, and the harder you kick the faster you accelerate. There's an example of Newton's second law. And what about the third law? Kick back against the pavement and the pavement pushes you with an equal and opposite reaction force that propels you forward. 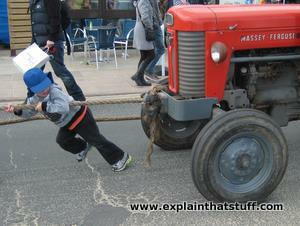 Photo: Another example of Newton's laws: 1) The tractor stays still unless a force acts on it. 2) When this boy (and his friends, who are out of shot to the left) supply a force by pulling on the rope, the tractor accelerates toward them. 3) When the boys pull on the rope, the tractor pulls back: that's what keeps the rope taut. Does that seem confusing? Think of it this way. Before the boy's friends arrive, he pulls by himself on the rope and can't move the tractor. The boy pulls the rope to the left, the tractor pulls it to the right, the two forces balance, and the tractor goes nowhere. One important thing to remember about the laws of motion is that they apply only to things that are moving—things in motion! So, for example, if you stare down at your feet and wonder why you're standing firmly on the ground without sinking in, the explanation has nothing to do with Newton's third law of motion (action and reaction). You're standing still because repulsive, electrostatic forces between atoms in your shoes and atoms in the ground (pushing upward) exactly counterbalance the force of gravity (pulling down). There is no motion, so Newton's second and third laws don't apply. The first law does apply: your body is still because there is no overall force acting on it. If the ground suddenly collapsed, the upward force would no longer be enough to balance your weight. There would be a net downward force, making you accelerate into the ground. How fast is that plane? Will my car get there faster than yours? Which of us will use the most gas on the drive home? How can you fire a rocket up from Earth and have it land precisely on the Moon? If you want to answer questions like this, you need to be able to measure motion. We have four main ways of doing that, using speed and velocity, acceleration, momentum, and kinetic energy. A sports car can go 50 times faster than you can walk and 8 times faster than you can run. That's because its engine turns gasoline into power much more quickly than your body can burn food to pump your muscles. The faster a car burns gas, the quicker it can go—the more speed it has. In science, we define speed as the distance something goes in a second. You can figure out a car's average speed by dividing how far it goes by how long it takes to get there. If a car is going at 100km/h (60mph), it can travel 100km (60 miles) in an hour. Here, d is distance and t is time. You can see from this that a car is a kind of time machine: you can use its speed to get somewhere more quickly. If you go twice as fast, you can arrive in half the time. The faster you go, the sooner you get there, and the more time you save. Of course, you can never actually arrive before you leave—that would be taking the science a bit far! Photo: These two gray cars have exactly the same speed but completely different velocity, because they're traveling in opposite directions. Velocity is not just another word for speed: it means your speed in a certain direction. When a Formula-1 car races round a tight bend, its speed stays the same, but its velocity is always changing because it's turning and changing direction the whole time. Suppose you drove from the North Pole to the South Pole in a straight line at 100km/h (60mph) and then drove back again at the same speed. Your average speed would be 100km/h (60mph), but your average velocity would be zero. That's because your velocity from South to North would be exactly opposite the velocity from North to South and the two would cancel out. Here again, d is distance and t is time. You'll notice this formula is the same as the formula for speed. But remember when you have to state which direction the velocity is heading in too. If you're a driver, acceleration means putting your foot down to go faster. But if you're a scientist, acceleration also means stamping on the brakes. That's because acceleration means any change in your velocity. Speeding up is an acceleration, but so is slowing down—it's just a negative acceleration. And because your velocity is your speed in a certain direction, you accelerate every time you go round a corner, whether you change speed or not. Photo: This red car is going round a curve at constant speed, but its velocity is changing all the time because its direction is changing. That means it's accelerating as well, even though its speed stays exactly the same! A car is a heavy lump of metal and it takes a lot of force to get it moving, speed it up, slow it down, or turn it round. The heavier something is, the more force it takes to accelerate. That's why trucks take longer to accelerate than cars, even though they have much bigger engines. People compare cars by seeing how many seconds they take to accelerate from 0-100 km/h (0-60 mph). If a car can go from 0-100 km/h in 5 seconds, it changes its velocity by 100km/h in 5 seconds, so its acceleration is 20 km/h per second. That's the same as changing your speed by 5.5 meters/second every second. Scientists write that 5.5 m/s/s or 5.5m/s2 (and say it out loud as "five point five meters per second squared"). Here, v is velocity and t is time. 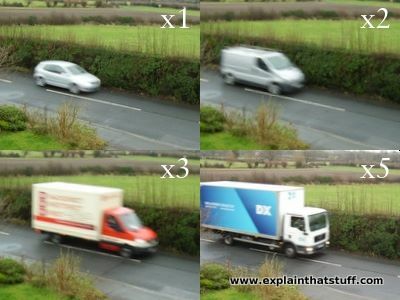 Photo: If a truck has several times the mass of a car, but moves at the same speed, it has several times more momentum. The silver truck (top right) has twice the mass of the car and twice the momentum, while the blue truck (bottom right) has five times the mass of the car and five times the momentum. If each vehicle were to crash into a brick wall and stop in exactly the same time, it would exert a force proportional to its momentum. So the blue truck would exert five times as much force as the car. Here, m is mass and v is velocity. If two things crash together, their total momentum is the same before and after the collision. This is a basic law of physics called the conservation of momentum. If a car crashes into a wall, bits of the wall start moving—so they gain the momentum the car loses and that's what slows it down. Here, m is the car's mass and v is its velocity. If you double the weight of a car (by adding a caravan on the back), you need to use twice as much energy to go at the same speed. If you want to double your speed, you'll need four times as much energy, because energy is related to the square of your speed. So the more force you supply, the more acceleration you get. But the same equation tells us that a = F / m, so the more massive an object, the less it will be accelerated by a force of the same size. If you weigh twice as much as a friend and I give you both the same push, your friend will accelerate twice as quickly. In other words, we can define force as the rate of change of momentum: the more quickly something's momentum changes, the more force is acting on it. The change in momentum is equal to the force acting on something multiplied by the time for which it acts, and it's called an impulse. The impulse is simply F × t.
Impulses are a really important concept in sport—for two reasons. Suppose you want to kick a soccer ball a long way, or hit a tennis ball really hard at your opponent. You'll need to give it lots of momentum (or energy, if you prefer) and to do that, you'll need to apply your boot (or tennis racket) to the ball for as long as possible—with what's called a follow-through. Making t (the time for which the force is acting) as long as possible produces a bigger change of momentum. If you think about it, t is the only thing you can really change if you're a world-class athlete: the ball has a constant mass (m) and you can only supply so much force (F), so the only way to maximize momentum (m v) is to maximize the time (t) for which you apply your force. Photo: Think sport? Think impulse! If you want to hit a ball as far as possible, you need to apply a force with your muscles for as long as possible: you can't change the mass (m) of the ball, but you can maximize the time (t) during which the bat touches the ball as well as the force (F) to give the ball as big a velocity (v = F t / m) as possible. 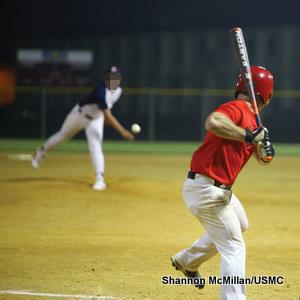 Photo by Shannon McMillan courtesy of US Marine Corps. There's another good reason why sports people try to increase the time for which they apply a force with their muscles. Suppose you're catching a fast-moving baseball or cricket ball. It's fairly heavy and hurtling toward you at high speed, so it has quite a lot of momentum. If you bring the ball to a halt slowly, by pulling your hands and arms into your body, you increase the time (t), so the force your hands and arm feel (m v / t) is smaller and the ball hurts you less. Try to catch a ball without moving your hands or arms and you're making t very small, which means m v / t is bigger and the ball will hurt you more. The same is also true of hitting a ball with a baseball bat or a tennis racket, throwing a javelin, or applying a force with your muscles in any other way. Generally, all sports people try to apply forces with their muscles for as long as possible to reduce the impact on their body and the risk of injury. Brakes: How do you get rid of motion when you don't want it? The law of conservation of energy: Why can we create or destroy energy? Energy: What is energy anyway? Gears: Why can you make a machine go faster or increase the force it produces, but not both at the same time? Science: A full list of all our science articles. Science of sport: How the laws of motion can help us understand sports like tennis, baseball, running, and swimming. A Crash Course in Forces and Motion by Emily Sohn. Capstone, 2019. The graphic-novel style of this 32-page introduction should appeal to reluctant readers and children who prefer comics to books. Described as suitable for ages 8–14. Can you Feel the Force? by Richard Hammond. New York/London: Dorling Kindersley, 2007/2015. A good, slightly irreverent introduction to basic physics, including Newton's laws. Ages 8–10. Forces and Motion: Investigating a Car Crash by Ian Graham. Raintree, 2014. A great example of how Newton's laws are used in the real world. With an engaging graphic novel format, this is another good choice for reluctant readers and children who struggle to find science relevant. Fatal Forces by Nick Arnold. Scholastic, 2014. A funny, cheeky guide to forces from the popular Horrible Science series. For ages 10–12, 128 pages. Science Investigations: Forces and Motion by Chris Oxlade. Wayland/Rosen, 2008. An alternative look at basic mechanics. Ages 8–10. Newtonian Mechanics by A.P. French. W. W. Norton, 1971. Excellent, classic introduction for undergraduates, but not overly difficult for high-school readers. Don't worry that it's an old book; it's still in print and easy to obtain—and Newton's laws haven't dated in 300 years! This is the book I learned from as a physics student. Physics: Algebra/Trig by Eugene Hecht. Thomson-Brooks/Cole, 2003. I came across the first edition of this book by accident when I was writing some physics articles in the 1990s and really admired the clarity of the text and illustrations and the comprehensive coverage (you'll find virtually every aspect of physics in here somewhere). Eugene Hecht does a very good job of conveying concepts clearly and briefly, with easy-to-understand math, and plenty of real-world examples. Ideally suited to high-school students (ages 16–18), though also good for older readers and brighter youngsters. It's relatively easy to find cheap secondhand early editions of this book if you can't afford the latest version. Laboratory Notebook by Isaac Newton: Read Newton's handwritten lab notes in this digital facsimile at the Cambridge University Digital Library.